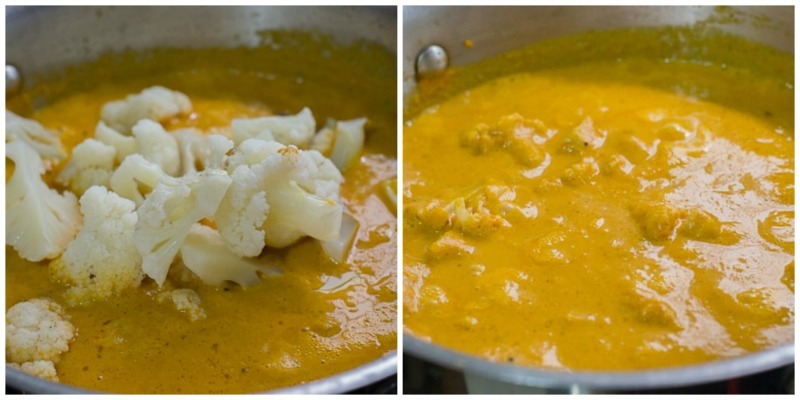 Kongunad Cauliflower Kurma / Vegan Cauliflower Curry. 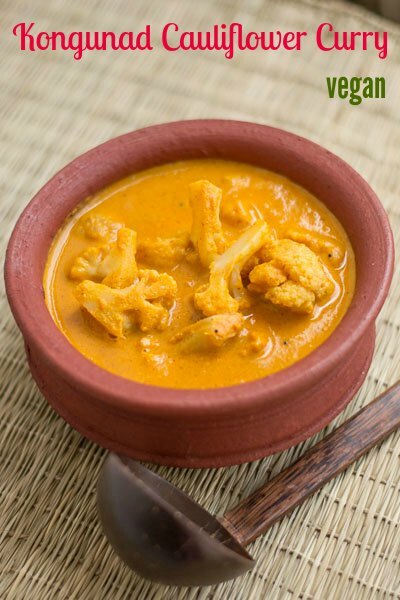 South Indian Cauliflower kurma / kuzhambu makes an excellent side dish for Idly,Dosa,Chapati,Roti or Rice. Made with coconut, this kuruma / curry is a sure winner. With step by step pictures. This cauliflower kurma / kuzhambu recipe from the kongunad region uses the simplest of the ingredients and spices. “Once you get a spice in your home, you have it forever. Women never throw out spices. The Egyptians were buried with their spices. I know which one I’m taking with me when I go.” This curry brings back memories every single time. My grand mother made this, my mom made this, my in laws made this, I make this and now you will make it too. 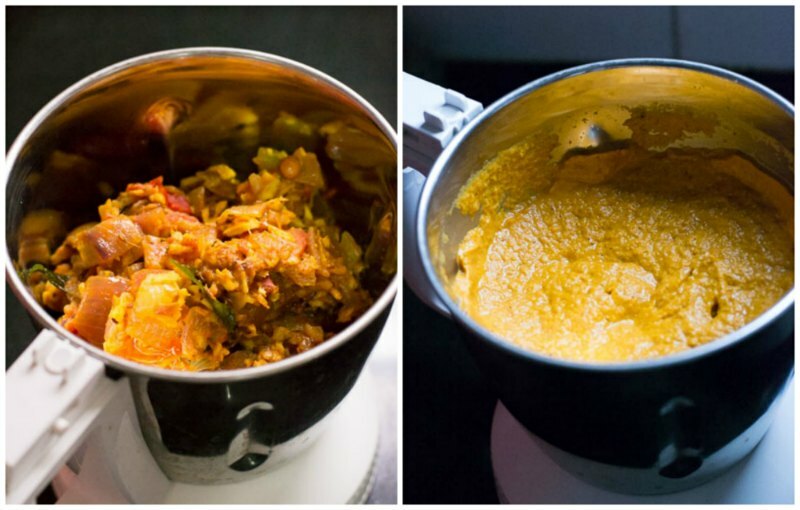 This is a fantastic awesomatic south indian curry which goes so well with Idly, Dosa or Roti. “Cauliflower is nothing but cabbage with a college education” – Mark Twain. Its an elegant, sophisticated, festive most sought after vegetable from the Victorian times. For this recipe, we need to cook the Cauliflower first. Boil the Cauliflower in water until its fork tender and set aside. Heat oil in a pan and add in the cumin, roasted gram (pottu kadalai as called in tamil) and the dried red chilli. Let it roast for 15-20 seconds. Add in the curry leaves, onions and salt. Saute in medium flame for a good 7-8 minutes until the onions are slightly brown. Once the onions are brown, dump all the other ingredients at once. Tomatoes, coconut, tamarind, turmeric and coriander powder. Saute in medium flame for a good 6-7 minutes until the tomatoes are cooked and juiced down. Remove off heat and let it cool slightly. Grind the mixture to a very very smooth paste…Did you hear that???? I am sorry that I am bossy. We need a fine paste. OK. “Oui, Chef”. You can add some water, up to a cup while grinding. Now its tempering time. Take a deep pan and heat a tablespoon of oil until hot. Add in the mustard seeds, cumin seeds and the curry leaves. Let it pop. Now add the ground masala paste. Add up to 2 cups water to thin the gravy. Let it simmer for a couple of minutes. Add in the cooked Cauliflower and let it simmer for a couple of minutes more. Remove off heat. South Indian Cauliflower kuzhambu / kurma makes an excellent side dish for Idly,Dosa,Chapati,Roti or Rice. Made with coconut, this kuruma / curry is a sure winner. 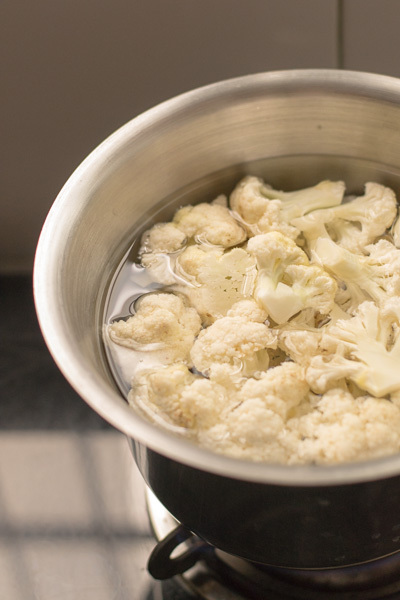 Boil the Cauliflower in water until its fork tender and set aside. Grind the mixture to a very very smooth paste. Take a deep pan and heat a tablespoon of oil until hot. Add in the mustard seeds, cumin seeds and the curry leaves. Let it pop. Now add the ground masala paste. Add upto 2 cups water to thin the gravy. Let it simmer for a couple of minutes. Add in the cooked Cauliflower and let it simmer for a couple of minutes more. If you boil the cauliflower first and add to the curry later how will the masalas get incorporated. I love to try your recipes. They are foolproof and comes out very well. Thankyou so much. Thank you so much Archana. Really glad. and just call me Suguna. Just cooked this for lunch today. We loved it. Is tamarind added as is or only the extract? Tamarind is added as is and ground in the paste. 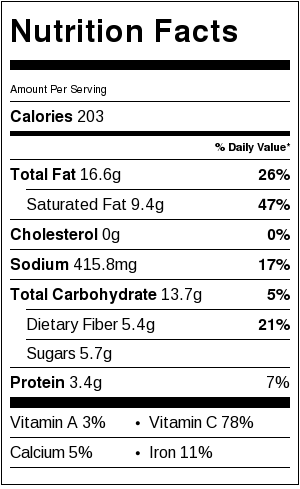 Can we add cashews instead of coconut? If not could you suggest some other alternate pls? Hi kannama.. can we add ginger garlic to this.. will ittaste well..? Just a doubt.. thanku.. This is a very traditional recipe where we never add ginger or garlic. It tastes good without it. Ginger will over power. It’s also my moms nick name. I got your website from one of my friend in Miami. I tried Kollu chutney and this Cauliflower Kurma. I love both of them. Awesome taste. I always search for Kurma recipes, Specially without ginger garlic paste. This Kurma will be my favourite. Do you bake without eggs by any chance and have good recipes without eggs? Thanks Gowri. Nice to know that me and your mom share the same name. We do have few eggless baking recipes in the baking section. Do check. We friends made this today and it came out very tasty. Tried this recipe today. The curry was very tasty. Goes well with both chapatti and dosa. Bookmarked it.Thanks for this recipe. Yummy taste, full marks to this gravy, am pregnant, am sure other pregnant ladies too like coz there is no heavy masala or strong smell…Instead of tamaring i added some pieces of potato with cauliflower , my taste buds asking to eat extra idly for this hot gravy? Thank you so much! Congratulation on your pregnancy. Hope you are doing well. I tried your recipe today and it was a huge hit with the family! Thank you. Thank you! really glad that you liked it! 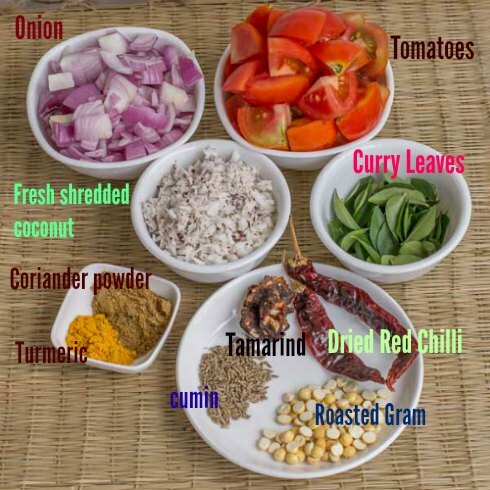 This is a wonderful, full flavoured, south Indian curry. It is easy to prepare, and tastes absolutely wonderful. This recipe is something that a beginner can cook with confidence. I am enjoying the recipes on this website in Australia. Thanks for the writing in Craig. I am really glad you are liking our recipes. Happy cooking. Hi Shwetha, I am sorry the recipe did not work for you. The recipe needs only Half a lime size tamarind which is roughly about 1 and half inch piece. I am doubting if you added more. This is my family recipe and we have made it countless number of times. Can you tell me if it was the tamarind? 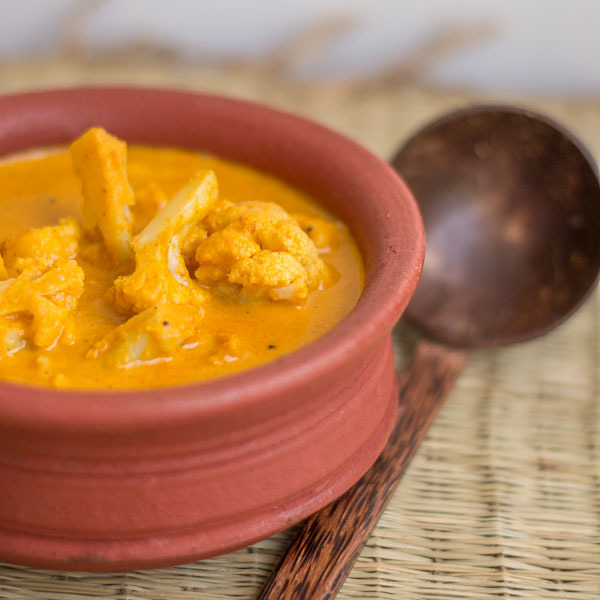 I have always searched for the perfect cauliflower kurma n this one looks so perfect. The color is amazing. Will try for sure. Sure Saraswati. Let me know if you like it! Amazing. Can this be eaten along with rice too? Yes. It tastes good with rice too. Thank you very much Gokul! Wonderful recipe. Very easy to prepare and tasted wonderful. Thanks a lot Sandra. Hope you will like it!